Israel's electricity and fuel allow Hamas to launch their rockets on Israeli citizens, Danny Danon notes. Deputy Defense Minister Danny Danon (Likud) vowed to stop Israel's ongoing humanitarian aid to Gaza on Wednesday, in the wake of hundreds of rockets being fired on Israeli citizens over the past week. Danon noted that to continue the aid defeats the purpose of the operation against Hamas. 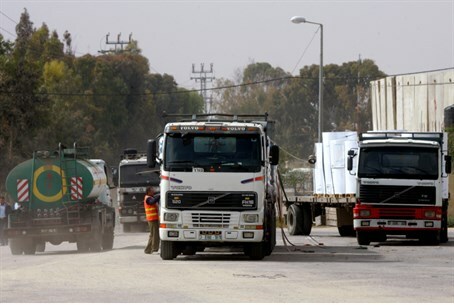 "We have to stop the entry of fuel and electricity to Gaza immediately," Danon stated. "You cannot fight Hamas on the one hand and provide electricity and fuel to transport the missiles fired at us on the other." Danon also stated that the continuation of aid would be a waste of vital resources - and would prevent Hamas from acquiescing. "We [are in the midst of a] campaign against Hamas, that fires missiles at Israeli citizens - we need to use all our existing leverage to bring Hamas to the point where it asks for a cease-fire," Danon said. Danon's statements echo similar calls by Transportation Minister Yisrael Katz (Likud), who made a strong argument for the move earlier this month. "We need to break away from the population in Gaza," he said. "We need to set boundaries and say goodbye to Gaza until there is peace - no fuel, no electricity, no water, no food." "It makes no sense for Israel to give the enemy these things," he continued. "We are responsible for an area which has no authority." Israel provides most of Gaza's water supply, electricity and communications infrastructure. In 2013, 1.2 million liters of fuel were transferred through Israel’s Kerem Shalom Crossing into Gaza, according to the IDF Spokesperson's Office. The fuel included 800,000 liters of diesel fuel for transportation, 400,000 liters of diesel fuel for Gaza’s power station, and another 200 tons of household gas. Israel also provides 100 megawatts of electricity to Gaza on a regular basis, including additional aid that was supplied during Hamas's energy crisis with Egypt earlier this year. Much of that electricity is purchased for Gaza by the Palestinian Authority (PA), which owes Israel 1.4 billion shekels (nearly half a billion dollars) for unpaid electric bills.